Dollywood’s Splash Country water park launches its most ambitious new water ride this Mother’s Day. 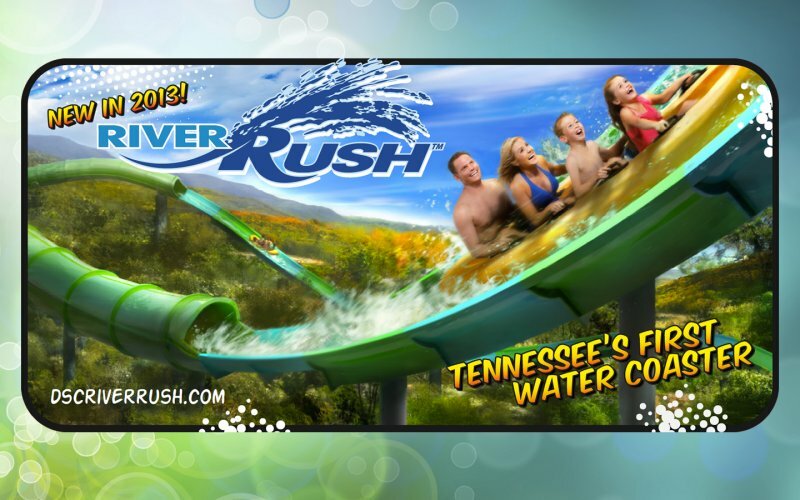 It’s RiverRush, one of the country’s few water coasters and a first for Tennessee. It promises to be a fantastic ride! What’s a water coaster and why is it such a big deal in a place like Splash Country, which already has a couple of dozen great water adventures? RiverRush is new technology that uses magnetic induction motors to move its 4-passenger boats uphill as well as down, propelling riders through the kind of action you expect from a roller coaster. That’s why it’s a water coaster – it combines the thrills of the roller coaster with the rush of a water slide. The ride lasts a lot longer than the standard water slide, clocking in at around 1 minute and 20 seconds from start to finish. RvierRush picks passengers up and drops them off at the same point too – no line of riders climbing to the top of the water slide – nice! The water tube track is a total of 1,175 feet in length, laid out over more than an acre, between Big Bear Plunge and Bear Mountain Fire Tower. The RiverRush experience starts with a conveyor trip lifting the toboggan-style boats to the top of the ride, 4 stories in height. The action begins with a 45-degree drop of 25 feet, followed by HydroMagnetic magic carrying riders through tunnels, up hills, round hairpin curves and through 3 more drops. It’s a high-adventure ride but don’t be afraid to take Mom on Mother’s day – the magnetic propulsion makes it a smooth ride too, one for all the family with no age requirements (just be taller than 42 inches). This one is going to be fun! Trust Dolly and the folks at Dollywood to continue their innovation streak. Last year they brought us the nation’s very first wing coaster ride, and now they’re bringing us the water coaster. What a summer it’s going to be! Splash Country, and River Rush, open for the season on May 11, with an early opening on May 10 for season pass holders. For more information see the Splash Country web site.